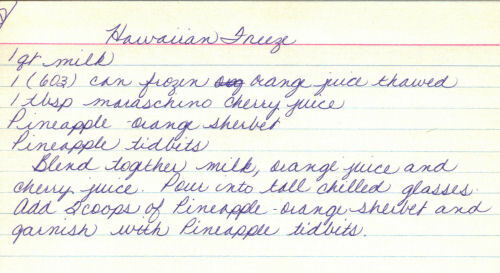 This recipe was written on a white lined recipe card and found in a large collection of recipes. Recipe is typed below along with a scanned copy. Blend together milk, orange juice and cherry juice. Pour into tall chilled glasses. Add 2 scoops of Pineapple-orange sherbet and garnish with Pineapple tidbits.